We are grateful and lucky to have celebrated our five year anniversary in January 2018. Many athletes have come into the gym, some have left, and a great many are still with us. However, there is a small group of people who have been a part of CrossfIt Critical Mass since the beginning and continued on to such influential members of our community. Margaret Boehmer is one of the four “OG” members of CrossfIt Critical Mass. She is an integral part of our family both inside and outside of the gym. We are proud to honor her as our January 2018 Athlete of the Month. Margaret works hard in classes, each and every time she is in the gym. She listens to her coaches and cheers on other people. 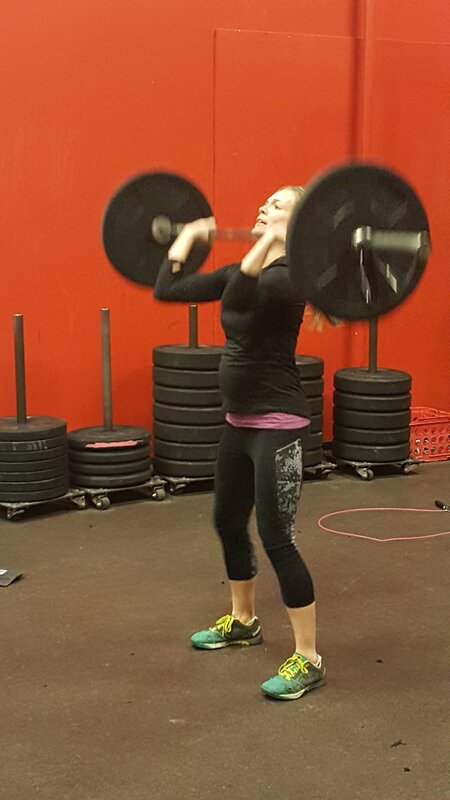 In 2016, she was out of the gym for months while she was pregnant with her first daughter. Even during that time, she was actively involved in our community by joining us at social events outside the gym and cheering us on in competitions. We are so happy that after she had her daughter, Madeline, she came back into the gym and picked up where she left off. She hit PRs and improved both her form and strength. She has always been a double under ninja and continues to be one. However, she has struggled through the years with chest to bar pull-ups. She recently got her first chest to bar and we know that many more are on the way. Margaret has just shared that she is expecting another little one to add to her family. She is still in the gym working hard and scaling her workouts as needed. We love her like family and can’t wait for the newest Boehmer to join us in the gym too. Margaret is a special kind of athlete, she works hard, pushes herself, avails herself to the coaches’ guidance, always has a good attitude, and is constantly supportive of our team. She is an integral part of our family. Frankly, she is truly strong and beautiful both inside and out. We are fortunate to have her as part of our #cfcmfamily. Please join the coaches of CrossFit Critical Mass in congratulating Margaret on being selected as our January 2018 Athlete of the Month.